SoftPlanet makes it possible for everyone to get free N-Button Lite download directly from our servers. There is no registration needed for downloading. 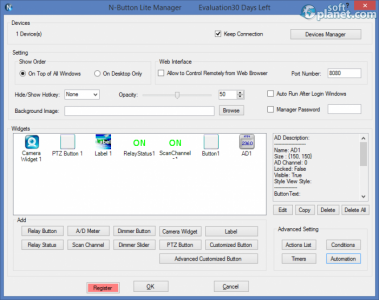 N-Button Lite 1.9.1.1135 is advanced software, designed to create up to 16 custom widgets, which will be placed on your screen, providing you with easy and quick access. These widgets enable you to access and handle external devices, send requests (HTTP), send data lists, etc. N-Button Lite 1.9.1 comes with serial port and USB connection support as well. This application enables you to create multiple widgets like Relay Button, Relay Status, A/D Meter, Scan Channel, Dimmer Button, Dimmer Slider, Camera Widget, PTZ Button, etc. N-Button Lite also allows you to control them through Internet browsers. The program supports action lists, like customize, timer actions, condition actions and automation. Basically, you are able to control devices according to predefined rules and conditions. N-Button Lite seems to be a great software solution for creating widgets, which you control external devices with. Please do not hesitate to share your user experience with us. Our security scan shows that N-Button Lite is clean from viruses. 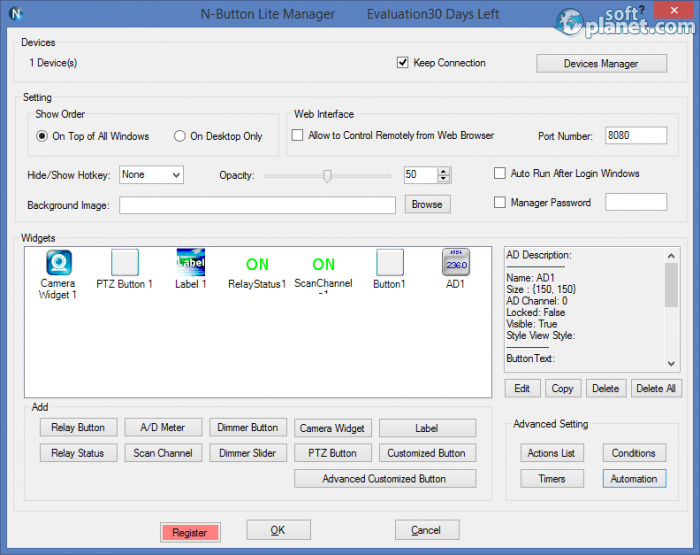 The current version of N-Button Lite has been scanned by our system, which contains 46 different anti-virus algorithms. That ensures that N-Button Lite 1.9.1.1135 is 100% safe for your computer.